She's Fantastic: McFarlane Toys - DAENERYS TARGARYEN! McFarlane Toys - DAENERYS TARGARYEN! Daenerys Targaryen, the First of Her Name, Mother of Dragons, Queen of the Andals, Khaleesi of the Great Grass Sea, Breaker of Chains, Queen of Mereen, Protector of the Realm, Lady of Dragonstone, the Unburnt. As a sit here beginning to watch the first episode of the final season of Game of Thrones, I'm reflecting on my first impressions of Daenerys Targaryen. In the beginning I thought she would be a pawn of other characters, especially her brother and the Dothraki. I viewed her as weak and a tool of male titillation. I was very wrong though. 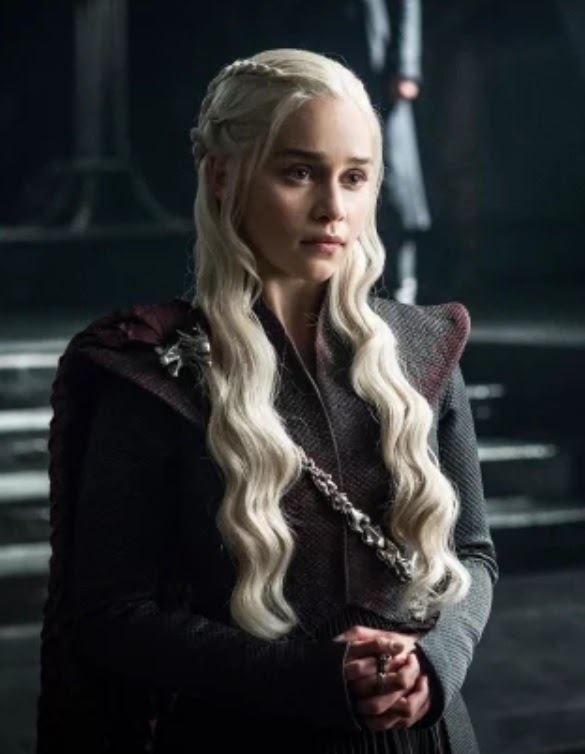 Those early scenes of her standing bare and being traded like fine goods was an excellent way to illustrate her growth from a timid and voiceless girl into the powerful decisive woman that we just may see take the Iron Throne this season. 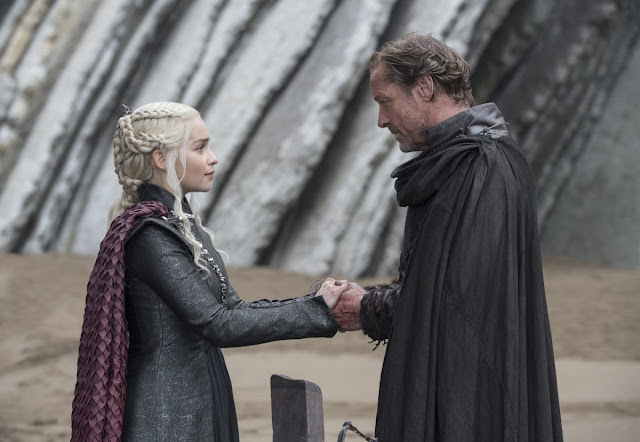 I've very excited to follow her progress through this final chapter and I'm rooting for her and her dragons. I'm excited that McFarlane Toys is bringing us new action figures and I hope the line continues past the final episode. While the likeness to Emilia Clarke isn't perfect, It is recognizable and a very nice figure overall. Let's check her out below! Her cape and clothes limit her poseability a lot. I think the Aria review will be able to shed more light of the level of articulation she has under there. Daenerys comes with three map markers from the Dragonstone Map Table: Sunspear, Dothraki, and Unsullied. They are tiny and in scale with the figure. I hope it's possible to build the entire map table eventually. This Daenerys figure is wearing one of her outfits from Dragonstone. Sometimes the shoulder cape is shown in silver or white, but I like this red version best. Here she is with the tow Funko figures figures: Version 1 and Version 2. Awesome figure. Hope McFarlane makes some more. GoT has so much potential for some cool figures.